This summer will be a hot one with four great country shows at First Midwest Bank Amphitheatre in Tinley Park! 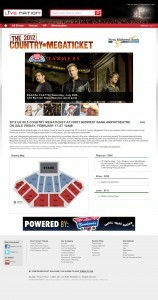 The US99.5/WUSN-FM 2012 Country Megaticket goes on sale Friday, February 17 at 10am. If you purchased a Megaticket last year, you should have received an email for the pre-sale which begins on Monday, February 6 at 10 a.m. The Megaticket will give you four Saturday night country concerts for one package price. The current lineup includes Sugarland on Saturday, June 23, Rascal Flatts with Little Big Town, Edens Edge and a to-be-announced special guest on Saturday, July 28. Jason Aldean and Luke Bryan with a TBA special guest on Saturday, August 18, and Toby Keith with Brantley Gilbert and a TBA special guest on Saturday, September 2. They’re currently offering three different seating and pricing tiers of tickets: Platinum, Silver and Lawn. Please see Live Nation’s site for more information.